TriMet gave a sneak peak today of one of its four new all-electric hybrid buses that will take to the streets by early November. These next-generation hybrids are built to be our most fuel- and emissions-efficient buses. The four all-electric hybrids will join four other diesel-electric hybrids on Line 72-Killingsworth/82nd Ave, a busy 17-mile route between North Portland and Clackamas Town Center. Line 72 serves a disproportionately high percentage of low income and minority residents who are affected by high emissions from transportation and industry. 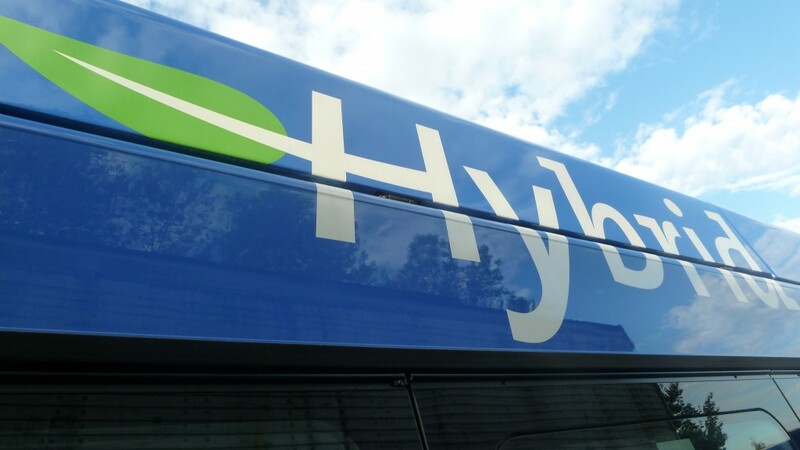 TriMet will have eight hybrid buses in its fleet of about 659. The other four hybrids have been running on the system since 2012. Using similar technology as the Toyota Prius, the bus’ diesel engine powers a generator which allows it to start. The engine then powers the electric motor, turning the wheels and electrifying the energy-storage system. Unlike the existing hybrids in our fleet, the newest ones can operate on 100 percent electricity for up to two miles. In addition, all of their accessories can be powered electrically such as the air compressor, hydraulic steering, HVAC and engine starting. When the brakes are applied, a lithium-ion battery stores the power for later use. During shut-off, the bus’ accessories are powered from electricity stored in the battery. Relying more on electricity to power these buses means using less fuel. Over a span of 50,000 miles, this hybrid would consume about 1,179 fewer gallons of fuel when compared with our standard diesel buses. The new hybrids’ diesel engines are designed to produce even less emissions as they comply with 2013 EPA regulations whereas our previous four hybrids comply with EPA’s 2010 standards. The new buses also use a lithium-ion energy storage system that increases battery life, which improves fuel economy and reduces emissions. These buses also can reduce engine-idle time with a mode that shuts off the engine, decreasing run-time by up to 25 percent. As the bus slows and approaches 8 mph, the engine shuts off. Leaving a stop as it goes above 10 mph, the engine starts again. These new buses combine the starter and generator to eliminate the starter motor and flywheel. This makes the system quieter, simpler and lighter while reducing maintenance requirements. The generator also powers the steering, air conditioning and fans for the engine-cooling system, which eliminates the need for an alternator. In 2012, TriMet received a $2.5 million federal grant from the FTA’s Clean Fuels Program to help pay for 80 percent of the new buses, which cost $705,000 each. These new buses help us get closer to the industry average of an 8-year-old fleet. Just two years ago, the average age of TriMet’s fleet was 12 years. We expect to reach the industry average of eight years in 2016. We know our riders want more and better service. That’s why, over the next few years, we’re working to grow our network of buses and trains—while improving the overall rider experience. We’re adding more service to connect more riders to jobs, education, community services and events. We’re also improving our trip tools so you have access to service information when and where you need it, along with convenient ways to pay your fare.